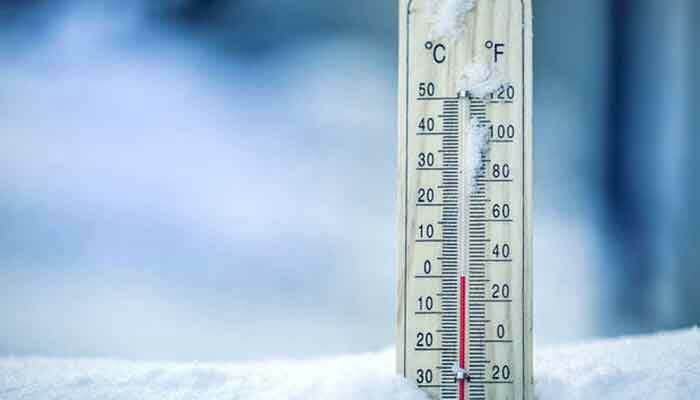 ISLAMABAD: Mainly very cold and dry weather is expected in most parts of the country. Foggy conditions are expected at a few places in plain areas of Punjab, upper Sindh and Peshawar division. Continental air is prevailing over most parts of the country.A westerly wave is moved away to north-easterly direction. Mainly very cold and dry weather is expected in most parts of the country. Foggy conditions are expected at a few places in plain areas of Punjab, upper Sindh and Peshawar division . Rain (with snowfall over the hills) occurred at scattered places in Punjab, KP, Islamabad, Kashmir and Gilgit-Baltistan. Kashmir: Muzaffarabd 70, Garhhi Dupatta 21,Kotli 06, Rawalakot 03,KP: Balakot 29,Kakul 19,Malmjabba 17, Peshawar 08, Saidu Sharif 06, Kohat 05, Kalam 04, Pattan, Cherat 02, Dir, Lower Dir, Risalpur 01, Punjab: Muree 14, Okara 04, Islamabad (Saidpur, A/P 07, Golra 04, Z.P 02, Bokra 02), Rawalpindi (Shamsabad 04, Chaklala 03), Jhelum 03,Mangla, Sahiwal, Kasur 02, M.B din, Gujrat, Lahore, Shorkot 01, Gilgit-Baltistan: Hunza10, Bunji, Chillas, Bagrote 03,Gilgit 01,Snowfall(inch): Malamjaba 12, Muree07, Kalam 04, Chitral, Rawalakot 02, kakul, Drosh, Astore 01, Bagrote, Hunza Trace. Kalam, Kalat -11°C, Skardu, Malamjbba, Quetta -08°C, Bagrote, Gupis -07°C, Astore -06°C, Chitral, Hunza -05°C, Dalbandin -04°C, Muree, Dir, Parachinar, Kakul -03°C, Mirkhani and Gilgit -02°C.